In every quote, White Glove includes the price for delivering all items to the new residence, removing packing materials from all furniture, reassembling and placing in the proper location, as well as placing all moving cartons in the proper room. Customers will then unpack all of their cartons. 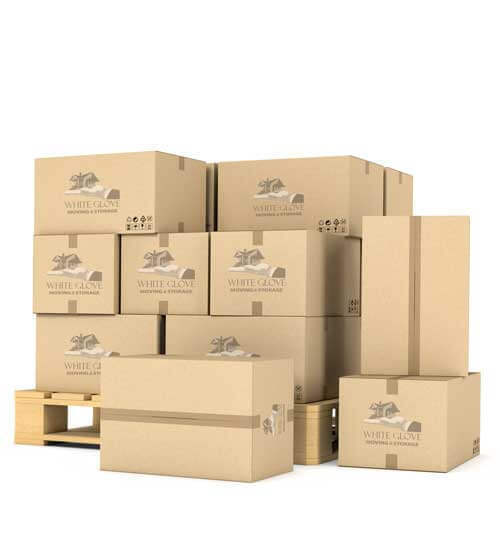 White Glove offers unpacking of moving cartons at an additional cost which can be provided as an all in cost for complete unpacking of all cartons or a by the hour cost for help unpacking the bulk of the cartons to make the process easier. White Glove will discard all cartons we unpack at no additional cost to the customer. Unpacking of cartons includes placing the contents on any horizontal surface, i.e. tables, counters, or the floor. For the customer that requires extra help at their new residence White Glove offers full Maid and Carpenter Services. This service is available after all items are fully unpacked and involves having our staff assist in cleaning your items and placing into cabinets, on shelves or tables, and even send a carpenter to assist you hanging pictures and mirrors. White glove will provide complete assistance in making your new residence comfortable.